Today’s recipe is my entry for Sugar High Fridays, a monthly food blog event started by Jennifer from The Domestic Goddess food blog . This month the event has been hosted by the owner of In My Box food blog. The task was to prepare a dessert that is at least 100 years old. I’ve been planning to make magdalenas for a while, so when I’ve learned that these little Spanish cakes have been actually baked since the Middle Ages I decided to give them a try. Magdalenas are little sponge cakes somehow similar to French madeleines. They’re incredibly soft and moist inside, and a little bit crunchy outside. 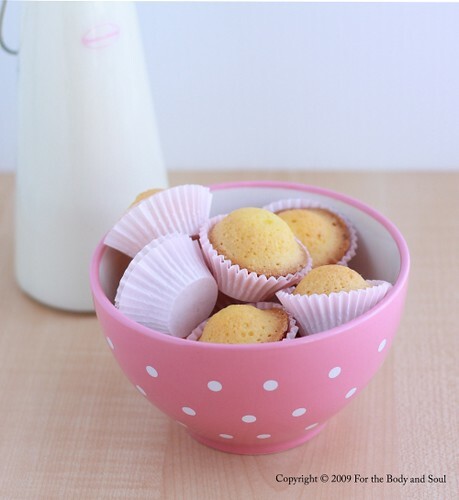 What makes them different from French madeleines is their shape - French madeleines are baked in pans with shell-shaped depressions, while the Spanish magdalenas use mini muffin pan. 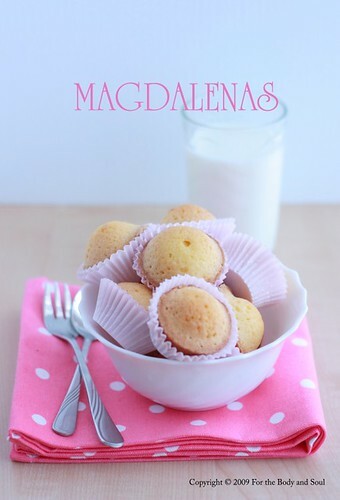 Unlike the French madeleines which are made with real butter, original Spanish magdalena recipes use olive oil. Even though some modern recipes replace the olive oil with margarine or butter, sometimes also adding some milk to the batter, I opted for the original olive oil version. Searching through Spanish food sites, I found a few similar recipes which used an equal weight of olive oil, flour, sugar and eggs, often with a hint of lemon. The only difference between the recipes was actually the amount of baking powder. Some of the recipes used significant amounts, while other didn’t use baking powder at all. I decided to check whether the baking powder is really necessary here and made half of my magdalenas with and half without it. The result? To be honest, I didn’t notice any significant differences in the structure of the cakes, neither in their flavour. Also, all the magdalenas have risen the exact same high, although the ones with baking powder were ready a few minutes earlier. As for the olive oil flavour, well, it’s palatable, but totally dominated by a wonderful lemon flavour, so no need to worry about that. And, if you really can’t stand a little bit of olive oil flavour, you can always use sunflower oil instead. Also, if you don’t have mini muffin pan, regular muffin pan will work as well. 1. Preheat the oven to 180 °C (350 ° F). Grease or line mini muffin pan. 2. Whisk the eggs. Gradually add the sugar whisking constantly until you obtain smooth batter. 3. Continue whisking, gradually pouring the olive oil in. 4. Fold in lemon zest and sifted flour. 5. Spoon into prepared muffin pan. 6. Bake for 20 to 35 minutes (the time will vary depending on the size of pan you're using). * you'll need about 4 extra large eggs in this recipe. Weight the eggs with their shells. I love magadalenas!! Recently, I bought a packet in my Spanish foodstore!! That reminds me of good times in Spain on holiday!! Now, I can make them myself!! Thanks for the delicious recipe!!! You have made my day!! What a beautiful post! They sound so delicious (olive oil and lemon in a sweet - I can't imagine anything yummier!) and your photo is so sweet and ethereal. I love how old recipes often call for equal weights of all the ingredients - people just didn't fuss around back then with 2/3 cup of this and 1/8 teaspoon of that. It was all by feel or by comparative parts. Thanks for a great Sugar High Friday entry! Come visit my blog on March 27th for the round-up! These looks so good! I had trouble choosing between these and the corn soup for Taste&Create, but I picked the corn soup.. it was amazing! It was so fun to cook from your blog! These look so very very cute ! Really quite amazing. Excellent recipe. I made it using half olive oil & half melted butter; increased the amount of lemon zest and sprinkled sugar on top. The cupcakes stayed moist and everyone loved it.